We were raised to serve to try to make a difference in our local communities. After realizing that so many families struggle day to day to make ends meet, although employed, we saw a gap in our system for those unable to get or qualify for traditional assistance. In September of 2011 we saw a segment on the NBC Nightly News about a remarkable organization in Portland, Oregon that was making such an impact for struggling families, Birch Community Services, Inc. Both of us were truly inspired immediately. We then contacted the organization’s founders, Suzanne and Barry Birch and thus began a relationship with two extremely special, gracious people. In August 2012, we then made plans and traveled to Portland to Birch Community Services to meet Barry, Suzanne, their special staff and volunteers. We witnessed this extremely well-organized operation at work and the success of their efforts. We then participated in a replication seminar along with others who had the similar calling to replicate the Birch business model, procedures and protocol that is truly highly successful. The next chapter of our very exciting and interesting journey – when Bentley Community Services, Inc. received in March 2013 its designation as an approved 501 (c) 3 charitable organization dedicated to providing high quality foods, basic necessities, household goods and adult education on an ongoing basis to struggling families in need. At Bentley, we do things differently than a conventional food bank/pantry and welcome those who need a hand up rather than a hand out and are prepared to participate in the unique, Birch-based method of meeting needs while working towards restoring self-sufficiency. Bentley is about community, volunteerism, accountability, integrity, caring and compassion as we serve one another. And, we invite our neighbors in the community to join us in this mission. 1. A theory of change based on accountability and the power of human dignity: At its core, BCS’ unique model of service delivery is founded on a belief that true charity comes from empowering each individual to restore his or her capacity to be self-sufficient, and that the most effective way to accomplish this process is within the context of a community in which participants work together to attain their goals. 2. Efficient redistribution of market surplus: What local producers of food and other staples consider as “excess inventory” is also the means for working, struggling families to meet their basic needs; BCS is the vital connection diverting those products that would otherwise be added to landfills, into the households of people who can use them. 3. Consistent leadership:: BCS’ founders continue to serve in key executive/ operative roles, active Board members and key volunteers from our communities provide strong leadership. 4. Weekly distribution of full shopping carts to clientele families to get them on the fast track to recovery to offset/eliminate their weekly grocery bills, providing them with healthy, fresh foods and numerous other provisions. We do not just give out an emergency box once per month or two bags of non-perishable cans and boxed product. 5. Families maintain decision making based on their own family’s needs. They choose from a full line of diverse food provisions: meats, poultry, cold cuts, seafood, fresh fruits and vegetable, full line of dairy products, milk, juices, eggs, fresh bakery and desserts, non-perishables for the household pantry and other items. 6. Our generous providers of product are just that, generous and they truly understand our program and help us tremendously by giving us high quality, diverse surplus provisions to help us impact the lives of our neighbors in need. What a great job on your web site. I am humbled by reading your story and realizing afresh how uniquely God plans our steps if our hearts are open. We are so proud of the job you’re doing and anxious to stay in touch. Here’s hoping plans come together so you can be with us again on September 22nd. Love you both! Thank you. Your kind words are much appreciated. Bentley is an organization that has not only supported my family and I through a tough time but also took a very stressful time and made us focus more on the blessing that God has given us instead. Thank you again and May God bless your service to people and keep the organization going. Many, many sincere thanks to your organization for helping our family through our tough and difficult times. We are having such a hard time paying down our debts, meeting our monthly bills and just the day to day things that cost a lot. Providing for our family has become extremely difficult until we came into your program. We are saving so much money because of all of the great, healthy and delicious foods and especially the toiletries you give to us, that we are slowly climbing out of debt and paying our bills down. We can put gas in the cars with the extra $$$. We are so fortunate to have you in our lives in our time of need. Thank you so much – we have so much to be thankful for because of Bentley! Being a part of Bentley Community Service has changed our lives for the better. We are parents who work multiple jobs and do all we can for our family. After being faced with medical bills and other challenges, we needed help. Bentley is there for us each and every week, with an abundance of healthy, fresh foods of all varieties. We have drastically cut down our grocery bill, and we eat out less. Now we have delicious, home cooked, nutritious meals! At the same time, we are getting rid of our debt. Thank you, Bentley, for giving us the support we need, and for renewing our hope. We are forever grateful. I am a volunteer at Birch Community Services. I volunteer to drive one of their 26 foot trucks for 10 hours each Monday. I am so glad to hear that your organization is doing well. I hope you are as successful as Barry (may he rest in peace) and Suzanne have been in Portland. It is a true blessing for all those families who are in need. Participating in the Bentley program is not only is helping us financially but is also making us healthier and happier because we are so much less stressed. It has allowed my family to save on supermarket bills which has drastically decreased our spending. This has allowed us to use the money saved to lower our credit card debt and more importantly our credit card debt stop increasing. Lowering our outstanding debt resulted in an increase of our credit score which allowed us to qualify for a refinance of our home mortgage lowering of monthly mortgage by $400. We have started to pay off our children’s college loans too! Savings attained by participating in the Bentley’s program has afforded me the ability to continue to make much needed home repairs and replacements, from our roof, hot water heater, to our outdoor light fixtures. 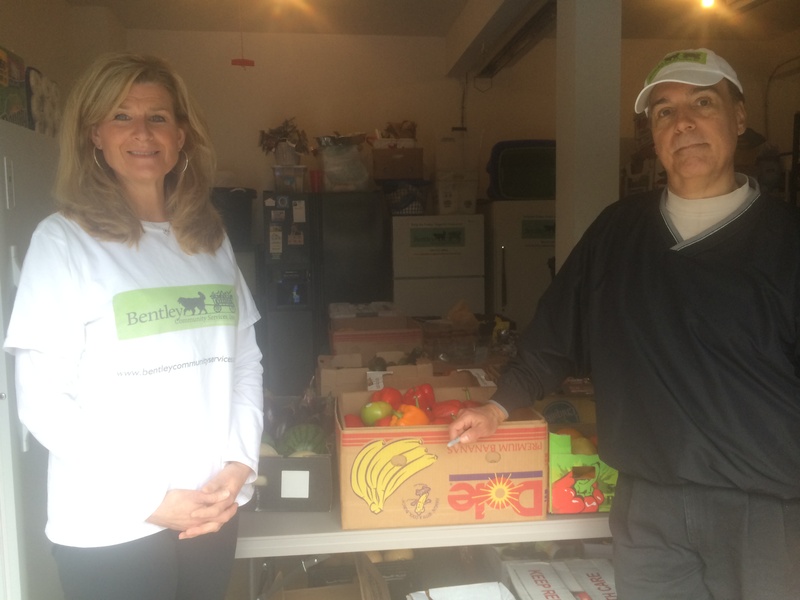 Bentley is a wonderful organization that provides healthy, nutritious, many organic food varieties to participant families. It also provides delicious fully prepared meals that you only have to heat up in your own kitchen. All of the food choices are wonderful, abundant, and diverse. Families are supplied with all of the food, drink, and toiletries to get them through each week, for a small monthly fee. Everything from soup, salad, meals, and dessert are distributed. With the help of this organization, families are able to use their saved grocery money for other necessities, like bills, gas, car and home repairs, etc. Bentley is a lifeline for so many individuals and family who are struggling in today’s economy. Bentley Community Services is a wonderful organization. They have helped so many families struggling in todays economy. Our family is forever grateful to be part of Bentley. Each week we are given a large variety of foods,drinks and more. For a small monthly fee we are able to shop for our family of 5, this has helped us work towards paying off debt and putting money towards other bills. Bentley Community Services has changed our lives. Thank you so very much for all of your help given to our family. Dorothy and Brant are a Godsend to our family and to the whole community. They are truly a blessing to so many people, and set the standard for how to be leaders who constantly give back. WE LOVE YOU & EVERYONE WHO VOLUNTEERS THEIR TIME, MONEY, AND ALL THE CONTRIBUTORS TO BENTLEY!!! Thank you so much Dorothy and Brent! I was so happy to get off the “no money for food” diet when I joined Bentley. And there’s so many tasty and healthy choices to pick from! I love feeling abundance when I open my refrigerator 🙂 and I’m very grateful to all those who donate too. My family and I appreciate Bentley community services.Dorthy and Brant give a lot of time and effort to collect donations to help our families and to make ends meet . We really value and appreciate all what you do. Thank you very much to Dorothy, Brandt and the supporting staff of Bentley Community Services. I look forward to shopping every week. The staff certainly makes sure we have what we need – my shopping cart is overflowing with groceries and special treats we otherwise would not be able to buy. We are very fortunate to have Bentley Community Services available to us. We have made a number of home improvements and we are able to keep a savings account for an emergency. We sincerely appreciate all the time and effort which goes into making the program successful. Thank you. What a great organization. A big Thank you to Dorothy and Brant for their endless work and dedication to the families in need that take advantage of this program. The amount of time and effort these two put into this company is incredible. Finding providers to help donate food, finding volunteers and on top of that they offer some wonderful and informative workshops. Thank heavens for wonderful people like the two of them. I can’t thank Bentley Community Services enough.. I am a single parent working multiple jobs to make ends meet. Being able to shop at Bentley every week has given me hope in a difficult time in my life. My family is eating very healthy now and I am able to continually pay down my debts. Bentley is a blessing!!! Thank you from the bottom of my heart to Dorothy and Brant and their beloved organization, Bentley Community Services and all their volunteers, donors for their endless dedication, caring ways to their community and devoted time to doing “good” and “impacting” their community in a positively endless way. Since I have come to have known Bentley Community Services my life has been impacted not only by the food and other donations received by Bentley but by the people I have met and relationships made, deeper awareness to volunteering my time to helping others and feeling great about it. Bentley Community Services has helped my family and I tremendously spiritually, financially and emotionally and for that my family and I are eternally grateful! I cannot thank Bentley enough!! I can’t thank Bentley enough. After four back surgeries, still recouperating and unable to work, Bentley came to our rescue! The food that we receive is healthy and delicious. We are able to keep a nutricious diet with fresh vegetables and meats. Thank you Bentley for helping us.